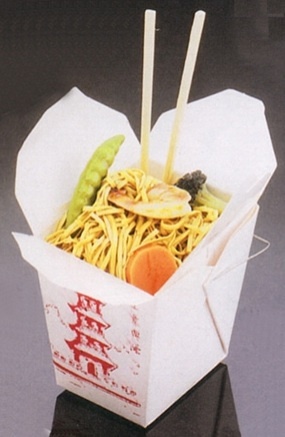 Take-out, carry-out, take-away, or tapau, is food purchased at a restaurant but eaten elsewhere. The restaurant may or may not provide table service. In the United States and Canada, food ordered this way (especially in fast food) is ordered to go, and in the United Kingdom it is sometimes ordered to eat out, as opposed to eating in. Take-out food is often fast food, but not always so. Whereas fast food carries the connotation of a standardized product from a global chain or franchise, take-away outlets are often small businesses serving traditional food, which can be of high quality. Food that is delivered by a restaurant to a customer (called “delivery”) is also sometimes called take-out; although it might be more properly labeled “bring-in”, it never is. The establishment that sells take-out exclusively (not providing table service) is called a take-out restaurant, take-out joint or a take-away. There is no clear line between street food and take-out. In general, there is an expectation for take-out that the consumer will have to sit and lay out the food packages for consumption. Certain types of food that are normally served in sit-down restaurants are commonly available as take-out. Pizza is one example. While certain pizzeria chains specialize in take-out (or delivery) to such an extent that they actually have no facilities for dining on-site (just a kitchen), most have tables and waitstaff. Even these establishments, however, offer the option of ordering by phone (or, increasingly, via the Web) and taking the food home. In such circumstances, the food and the procedure is commonly called carry-out. Another U.S. classic take-out food is Western-styled Chinese food. 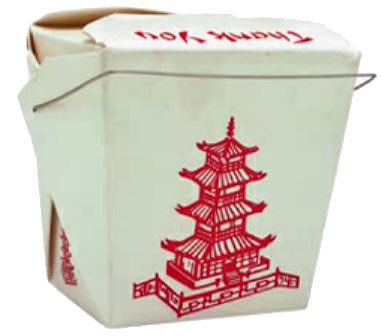 Ordering Chinese take-out has reached near ritual status in certain segments of the US population, as well as the United Kingdom, especially college students. In the past few decades as immigrants from more and more Asian countries emigrate to the US, more and more types of cuisine are being treated in a similar manner: Japanese, Thai, Korean, Vietnamese, etc. Some businesses have taken a cue from the ever increasing popularity in take-out, and have created franchises to deliver food from restaurants not normally associated with take-out or delivery. If it is possible to choose, the choice is between “to take out”/”to take away” and “to eat in” in the UK and Australia; or “to go” and “for here”/”to stay”/”dine in” in the USA. Most of these terms are used interchangeably in Canada.